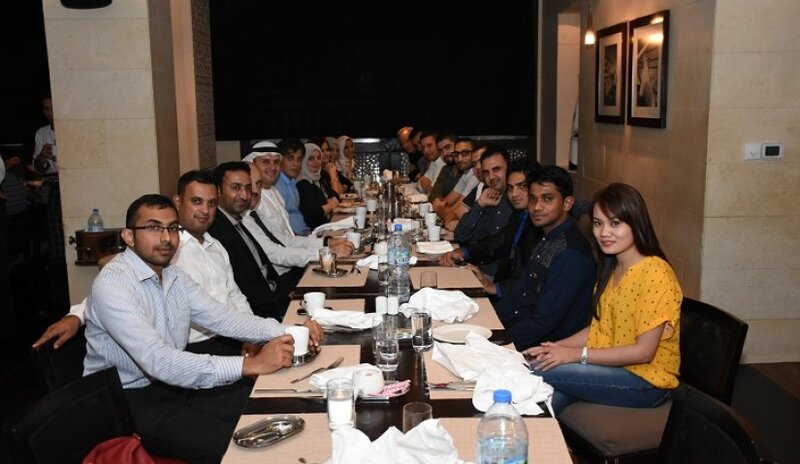 Al Falah University in Dubai organized an Iftar during the holy month of Ramadan, which was held in the presence of Chancellor and vice president for academic affairs, Dr Noor Aldeen Atatreh, and Dr. Sameer Al Barghouthi respectively, in addition to the heads of departments and a number of academic and administrative bodies. Dr. Atatreh congratulated all for the month of Ramadan, wishing everyone success. He said that the occasion of holding the Iftar is for renewing the spirit of harmony and friendship, and to promote social interaction amongst all as a family. Al Falah University starts this year its first gathering and celebrates on this occasion and this event came as a desire to strengthen the bonds of belonging, social communication among all staff, which in turn creates a good working environment. Furthermore, Dr. Noor confirmed the importance of each employee role in the successes that AFU has achieved so far and the efforts they need to implement for a recognized and acknowledged academic year commencing September 2015. He extended his support to all employees and encouraged them for deep commitment and innovative efforts to AFU that it continues to improve in order to meet every challenge successfully as AFU move forward into the future. At the end of the event, all employees and staff expressed their appreciation to the university administration wishing further success and progress.